News and rumors regarding the Samsung Galaxy S5 continue to arrive thick and fast, so prepare to have your mouths watered as it appears that the Galaxy S5 and also the Galaxy Note 4 are likely to step up to 560ppi displays. Samsung has stated that new displays with resolution of 2560 x 1440 will be used in some of its smartphones next year. Recently we heard that Samsung had lowered its expectations for the Galaxy S5 next year and was to focus more on low and mid-range devices. However, just in the last few days we’ve heard speculation about an improved camera for the Galaxy S5 as well as a 64-bit processor. Therefore it doesn’t look as though those looking forward to the Galaxy S5 have anything to worry about. The Galaxy S4 has a 5-inch Full HD display with resolution of 1920 x 1080 and 441p that has earned high praise. It’s difficult to imaging the quality of a 2560 x 1440 560 ppi WQHD panel then, but they’re on the way! 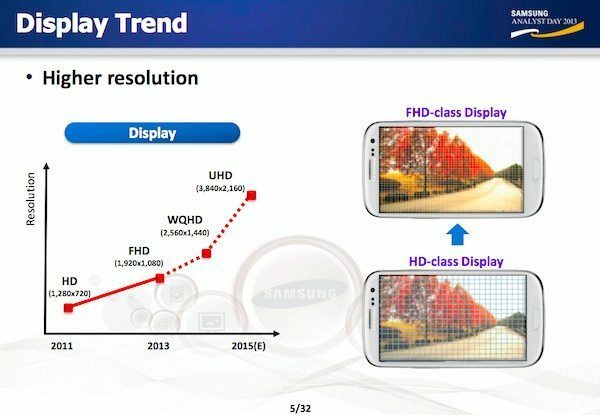 As well as this news there’s even greater stuff to come as Samsung says that by 2015 some of its phones will have 4K displays with resolution of 3840 x 2160. This means that phones such as the Galaxy Note 5 and Galaxy S6 could have twice the display resolution of phones that have 1080p displays today. For now we’d be happy to see next year’s Samsung Galaxy S5 and Galaxy Note 4 with 560 ppi displays, and if these panels do arrive next year as Samsung states, there’s no reason to think that these flagship devices won’t feature them. Are you pleased to hear this further progression for displays that are likely to appear in the Samsung Galaxy S5 and Galaxy Note 4? What else would you like to see on these handsets when they appear next year? Let us know with your comments.